In the heart of the “pays d'Auge”, 15 km from Deauville, the Golf Barrière Saint-Julien has a 27-hole course in a perfectly landscaped and maintained 90-ha area. 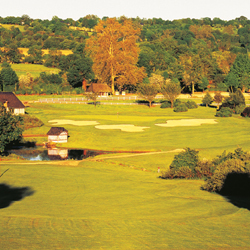 The course richness and diversity have turned this golfing area into an ideal place to refine your swing and improve your playing technique. In this course, opened in 1989, the architects Alain Pratt and Bill Baker designed two (18- and 9-hole) courses in a totally British style. The Vallon is a championship course, where several basins are maliciously included among fairways and greens. It offers fascinating perspectives on a typically Normand environment with flowering apple trees. The Bocage, named so for the quality of landscapes, is a course especially created for beginners. The fairways comprise huge roughs, ensuring an easy understanding of the course that includes several blind holes. Situated between timber framing farms and white apple trees, the club-house, embellished by the architect-decorator Jacques Garcia, is an opportunity to relax in a regional-style atmosphere. Large windows ensure a nice view on the landscape, and the restaurant offers a traditional local menu.